Benedictine’s Advocacy Coalition of the Eastern Shore, or A.C.E.S, was honored with a visit by Deputy Chief of Staff, Office of the Governor, Jeannie Haddaway-Riccio, along with Eastern Shore Outreach Coordinator, Ryan Snow during the group’s meeting on Nov. 27th at the Employment Resource Center on Benedictine’s campus in Ridgely, Md. 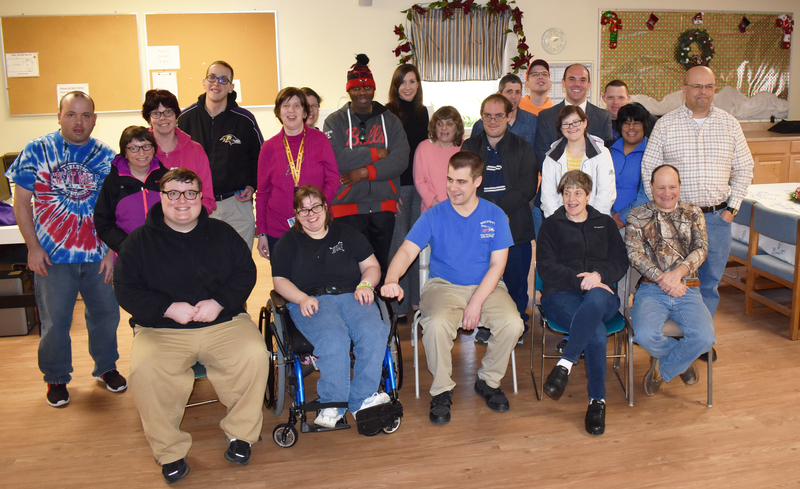 Visitors from the Governor’s office spoke with individuals from Benedictine’s Adult Services program regarding the roles they play in their positions, listened to concerns from the disabilities community, and took time for questions. Discussion topics during the visit covered everything from the challenges for job seekers to favorite sports teams. Haddaway-Riccio shared with the group her personal connection to Benedictine, noting her mother-in-law formally worked with the organization. The advocacy group meets to engage in meaningful conversations about individual rights within the disabilities community. Previous guest speakers have included representatives from the Department of Rehabilitation Services, the Department of Disabilities, and People on the Go.